There’s no denying that the internet has drastically changed how we live our lives. These days we have access to vast amounts of information and countless services that make things easier and more efficient. That definitely applies to how we save money for our various financial goals. No longer are we stuffing money under the mattress or in a jar in the cupboard. Instead most of our money just exists digitally where we can move it from account to account with the click of a mouse. It’s no longer limited to regular banking hours. You no longer have to wait days or weeks for payments or transfers to clear. Rather than wasting time going into the bank and waiting in line, it is now easier than ever to open a savings account online. You can open up a new account through various online banks. Or if you have internet banking with your current bank, you can usually open an account directly through your online banking website. This way you can also take your time to properly read the features of the account you are applying for. You won’t be pressured into signing up for the specific account that gets the teller the biggest bonus. It’s better to read the fine print before applying rather than later finding out all of the downsides. While looking into the account details, you can easily compare that account to the other types of accounts your bank offers, as well as the accounts offered by other banks. You can be sure your bank teller won’t show you details of their competitor’s accounts. Do a bit of research and you should even be able to find websites that provide a side by side comparison. This will make it easy to see who offers the lowest fees, highest interests rates and best extra features. Don’t settle for a sub-par savings account. Not only does the internet make it easy to open an account and compare offers, but is also an incredible source for savings tips and advice. Finance blogs provide some personal advice about what has worked well for them or what they have learned from others. Commercial websites often have helpful articles straight from professionals. Or you can even find a free financial advisor to give tips based on your own situation. From this advice you’ll find that saving money isn’t just about finding the best account. There are all kinds of strategies you can use that make it easier to stay motivated or find more money in your budget to put towards saving. If you’re willing to get a little frugal or entrepreneurial, there is no limit to how much money you can save. These days you don’t want to just rely on your current bank to give you the best savings account. The smart savers shop around to find the best account. They also don’t just assume their own savings strategies are ideal. Instead take the time to learn from other people’s experiences. Even if you open your savings account online, don’t forget about the power of personal service. There are times when talking to a bank teller in person or on the phone can result in an even better deal. You might be able to get fees waived or get a better interest rate. If you ask, the worst that can happen is them saying no. How have you used the internet to make saving money easier? 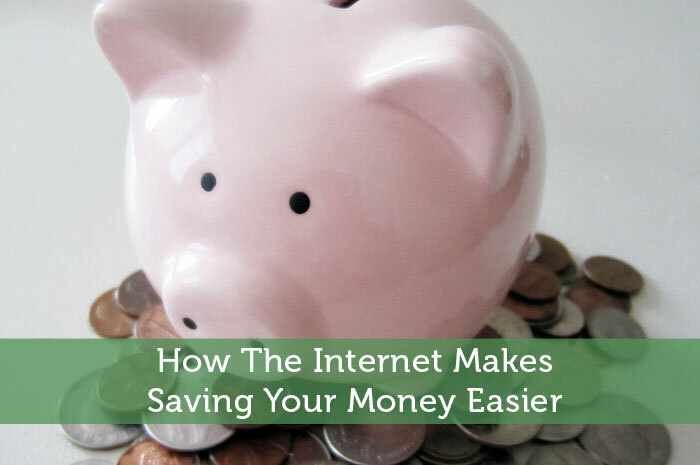 I would agree that using the internet does make saving money easier. It can also make earning interest on your savings better as many online only vendors will offer better interest as they don’t have the cost associated with physical brick and mortar branches. We do the large majority of our savings on line and just have a small savings account at our local bank in the case we need cash quickly. I agree that there is something to be said for personal service. No matter how big savings on line will get, I think we’ll always have local banks as many people will always want that personal touch. Good point about how online banks can offer higher interest rates due to lower overhead. The interest rates offered by most brick and mortar banks are extremely low. When you take into account inflation, you are actually losing money on those accounts. The internet has made things so much easier. Now there is no need to get in your car and make a special trip to the bank. You can scan a check on your smartphone or on a home scanner just to make a deposit. You can move funds around from one account to another. It is so much easier than it was 10 years ago. I wonder if the banks here have the check scanning feature. I’m actually about to go walk to the bank to deposit a check. It would save a lot of time if I could just scan the check. Of course I’d need to get a smart phone first. I use ING Direct and their online interface makes managing my money much easier. I love the automatic savings plans, the ability to open multiple savings accounts and being able to name them for my targeted goals. I’ve never used ING but I’ve heard good things about them. The ability to setup automatic savings would be pretty useful. I’m with Lance – I’m an ING girl! It’s so easy to transfer money around. It’s (that is, the Internet) also great for keeping track of what I’m spending, and what I’m saving! I thought that catch with ING is that it wasn’t very quick to withdraw your money. I guess it would at least be easy to move between your bank and ING, as well as between your different accounts within ING. That is true…the internet does make things easier. Especially the sites that let you use a sign in name, so you don’t even have to fish out your wallet. We try to immediately phone “our banker” whenever there’s an issue or we have a question. Developing that will save us a lot in the long run. Usually I only sign into my online banking from my home computer. So that isn’t much of a problem for me. It would be a hassle to have to enter your full account number every time you log in though. I use the internet for banking probably 90% of the time. I don’t have an ING account, although I probably will get one eventually to do a little automated saving for stuff we want. I mostly use my credit unions online site to transfer money to trading accounts and pay bills. Doing it online is way easier than having to make the 10 mile drive to do it in person. With ING I often see them having promotions where you can get free cash just for signing up. Or you could try signing up for their affiliate program and sign up through your own affiliate link. A 10 mile drive to get to the bank is rather excessive. I can walk to my bank in less than 10 minutes. We were talking about this the other day. Everything is easier now with the combo of internet and smart phones. I always have a good restaurant to eat at, access to my favorite sports teams, and easy ways to transfer/pay/track my funds. Yes we live in a world of convenience. It will be interesting to see just how much more convenient it becomes in the next 10-20 years with the ever evolving technology. Yup, I’m right there with you. We don’t go to the bank anymore, and manage everything online. We, like some others, use our ING for targeted savings, and local banks or paying bills and short-term savings. Between online banking and budgeting tools like mint, savings money has never been easier! Sounds like you’ve got a good setup with your different bank accounts and online tools. I still need to find a way to avoid the trips to the bank, but since it’s only once a month it isn’t too bad. That is time that could be used for blogging though. I had a savings account for the purpose of saving at one point, but the interest it generated was so crappy compared to what I could get with a really safe laid back investment strategy that I didn’t bother counting on the bank to make me any money. At best, a CD might be worth considering, but the rate from a savings account is typically pretty low – at least here in U.S.
I’m the same way with savings accounts. The interest is so low that I mostly just use my checking account and invest money if I want to save it. I haven’t had any short term savings goals recently which makes it easier to maintain that approach. I’ve used ING Direct for 5 or 6 years now, and have always been happy with it. It’s easy to set up sub-accounts for different savings goals, and to schedule automatic transfers. Though, I also have a savings account at my brick and mortar bank. It must be working well if you have stuck with them for that long. I should probably look into opening an account there myself. It would be good to keep a small emergency fund there where it is at least earning some interest,. The Credit Unions around here need to get with the times. They all appear to be part of the same network because all their sites use the same base setup and they all stink. That isn’t too smart of them. Today’s banking customers heavily rely on internet banking. If a bank or credit union is lacking in that area they are bound to lose business. I get a better interest rate on most of my accounts because I’ve signed up for automatic payments. I’ve also benefited greatly from PF blogs and those crazy mommy coupon blogs. Tons of great deals I never would have known existed, even though they’re in everything but the banking sector. That’s interesting that you get higher interest rates by signing up for automatic payments. I don’t think my bank offers anything like that, but maybe I’ll ask next time I’m there. I haven’t been on any of the ‘crazy mommy coupon blogs’ in a while, but that’s mostly because they are usually US based. I do agree that it has really contributed to the fast pace of life these days. As everything gets quicker and more efficient people become a bit spoiled and impatient. And I can barely remember the days before the internet, but it was only recently that I really started using it to help save money. I have had a total mental shift in terms of opening savings accounts online. Just like I would no longer buy CDs/DVDs in the shops because I know I can get cheaper online, same goes for interest rates on savings accounts! I have taken advantage of a few online exclusive rates and am very happy with them (in comparison to branch rates)! Cool to here that there are higher exclusive rates for opening accounts online. That makes sense since it is cheaper to process an online account opening compared to one opened in a branch. Plus the more services that are processed online, the better service they can offer to the customers who do still go into the branch. Absolutely… It will stop in-branch staff trying to rip-off old ladies by selling them high commission products too! Can you tell that I am bitter? Hey it’s not just old ladies. They will target anyone who they think they can convince to take their high commission product or service. It’s just the nature of sales. You are right about the internet making things much easier. Set it up and you’re on auto pilot. If I had to drive to the bank, I might spend something along the way. lol I had this very issue today. I had to walk to the bank to deposit a check, but it happens to be beside a donut shop. So I grabbed a bunch of dimes and nickels from my change bowl to get a treat for the walk home. If I were able to deposit that check by scanning it with a smart phone, that treat money would still be in my bowl. One of the banks that I am with has recently opened a facility to allow me to put my money in term deposits online. None of my other banks allow me to do this. Seeing as I have a mortgage I won’t be using the facility just yet, but it will make life a bit easier for me when I don’t have a mortgage and want to put some money into term deposits. That’s a cool feature. I love that I can contribute to my retirement savings accounts online. I just need to get around to switching it to self managed investing so that I can invest in specific stocks. If it’s as convenient as being in the same building as your office, I don’t blame you for depositing via a teller. With that amount of money I’m sure you want a bit more accountability with the money properly ending up in your account too. Of course you know they are kinda forced to ask about the renters as a security precaution. My bank often asks me stuff about my online income checks as if I’m pulling some scam. I don’t mind it though. Internet has made banking so painless for me. I can set up auto payments from my online checking account. I can check balances whenever I want without calling the branch, and in many instances, I can transfer money from one account to another using ACH without paying any fees. I love it. It is super convenient how much you can do with your online banking without incurring any fees. I would be pretty annoyed if I did pay fees on those transactions since they’re all digital without any processing required. I would agree that the internet has made saving easier for me. It’s a lot easier and faster to compare rates and see if I’m getting a good deal. It’s also easy to set up accounts online for savings and investments. Yep all of those things are so much easier today. I can’t imagine trying to compare accounts from other banks when you’d have to call each of them up on the phone. I think in that case people would just be more likely to just stick with what they have. The internet has totally changed the game in regards to being able to do research, compare companies, and educate yourself on the various options available to you. I love being able to search for the best online banks or comparing credit cards…it’s been awesome! We are pretty spoiled with how easy it is to compare options and learn more online. I’d think some companies don’t especially like this new landscape, especially when they are too small a company to realistically compete. I love the instant gratification you get on the internet by saving as well. You can see it in your account in moments. It makes it a lot funner to save. That is true. At any time you can see your balance and see how much interest you have been gaining. It’s a lot better than just getting a monthly statement in the mail. When we switched banks earlier this year, we did the research online but made the final decision of what accounts to open while talking to a bank employee. Social interaction I’d still an important part of banking to me and I think better of banks with friendly employees than I do places that seem to want to get the transaction over as fast as possible. Yes some people do still prefer the personal route. I’m the same way in the grocery store. I’d much rather get personal service than scan my own groceries in the self checkout lane. I guess it depends on your priorities. I use the internet to find the best high yield savings accounts, like many people but the way the internet has most changed my financial life is by making it possible to educate myself about finance, debt and money. Ten years ago, I didn’t pay much attention to my finances. I was fresh out of college, had a good job and was perfectly happy paying months in interest to buy the latest gadget or game. Then life intervened and marriage and baby ensued. Not long after that I had to clean up my habits and get a grip on things. I wouldn’t have been able to turn my financial life around the way I did before the Internet. Plain and simple. A marriage and baby are good reasons to turn around your financial habits. We are pretty lucky to have the power of the internet to improve our finances, whether it be from learning or using the various online tools.